Sale: CNG 61, Lot: 2199. Estimate $7500. Sold For $8150. This amount does not include the buyer’s fee. Purchased from Bank Leu, circa 1985. Charlemagne continued to strike ‘star tremisses’, based on late Roman monetary system employed by Lombards, in his own name until 781. The FLA in the reverse inscription before the mint name is an abbreviation for “flavia”, which Bernareggi believed to be a title given to cities which represented a political commitment the monarch. 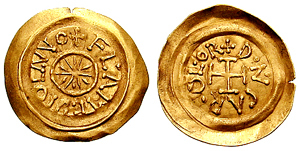 Desiderius, the last Lombardic king of Lombardy (757-774); had created for the first time a unified Lombardic coinage and opened mints at Lucca, Milan, Pavia, Piacenza, Catel Seprio, Treviso, Vicenza and other places. [New Paragraph] For the first five years of his reign, Desiderius pursued a policy of friendship toward the Franks, culminating in 770 with the marriage of his daughter to Charlemagne, but relations soon deteriorated when Charlemagne annulled the marriage the following year and sent the Lombard princess back to Italy. After the death of his brother Carloman in 771, Charlemagne seized his territory and proclaimed himself sole king of the Franks. Carloman’s widow and sons sought refuge with Desiderius just as he began an offensive against the new Pope, Hadrian I. Consequently, Hadrian appealed to Charlemagne for help in late 772. In 773 the Frankish king crossed the Alps, successfully besieged the Lombard capital Pavia and took the last Lombardic king and his queen as prisoners to France in 774. Charlemagne proceeded to confirm the Patrimony of St. Peter, receive the title of “Patrician of the Romans” and take for himself the crown of the Lombards, now in the treasury of Monza cathedral.